Difficult to identify who using shared account username. The user will be force to identified themselves. Doesn’t know what exacly user do after login to the server. Can playback every user activity. Difficult to know if Third Party Vendor still working based on the scope. The log will be on Visual. Difficult to understand the log for troubleshooting. Only need to see all the user activity on one web console. Difficult to monitor all user activity. The alert will be send every time the user running blacklisted application or command. Difficult to know who using blacklisted application or command. Shows exactly what users/admin were doing in real-time! 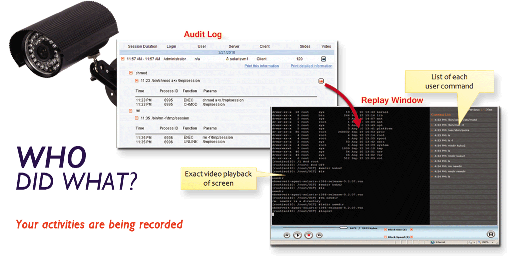 ObserveIT’s session recording system captures video of all on-screen activity while users work in Windows and Unix/Linux servers and desktops with the most advanced technology available.